I am loath to spend any time thinking about Donald Trump’s tweets—the misspelled ejaculations of a broken brain—but this morning, unfortunately, we must. If I wasn’t completely drunk on the knowledge that Trump will be president until I die because our Congress is full of besuited hemorrhoids, I’d say that was—in addition to being a supremely hateful string of words—sexual harassment! 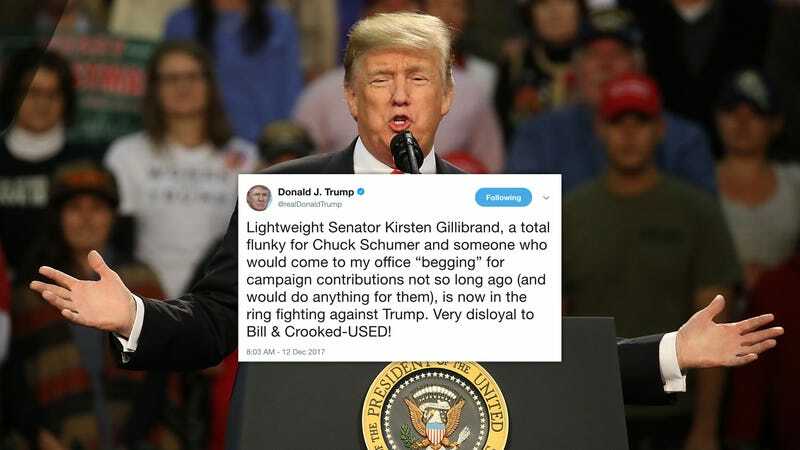 The tweet came in response to Sen. Kirsten Gillibrand’s call for Trump to resign over numerous allegations of sexual assault—what used to be a fair standard for a politician to resign from office. “President Trump has committed assault, according to these women, and those are very credible allegations of misconduct and criminal activity, and he should be fully investigated and he should resign,” she said on CNN on Monday. Gillibrand’s call for the president’s resignation follows that of Sens. Bernie Sanders, Jeff Merkley, Ron Wyden, and Cory Booker, as well as the actual resignation of Democratic Sen. Al Franken. Yet, Trump hasn’t accused any of these men of “doing anything” for campaign contributions. He hasn’t described them as “used,” a word that forcefully implies that the recipient is an object that can be worn out. God help my blood pressure!! !